Chichester Baptist Church will be hosting a charity concert in aid of Dementia Support, the new dementia hub based in Tangmere, at 7.30pm on Saturday, July 7, as part of the Festival of Chichester. Organiser Chris Coote said: “The concert will include a wide selection of music by gifted performers with a local connection. Popper’s Tarantella will be played by 15-year-old Bognor-based cellist James Dew, who attends the junior department of the Royal College of Music, and Mark Zarb-Adami will play Earl Wild’s piano transcription of Gershwin’s I’ve got Rhythm. 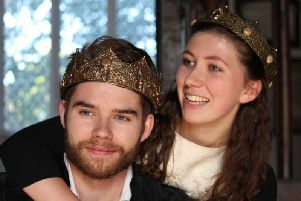 “Soprano Olivia Moss, who has recently completed the prestigious Glyndebourne Academy programme, will sing popular opera arias by Handel, Mozart and Verdi, and Ian Clark will sing songs from shows. Flautist Paul Dorrell will play Chaminade’s Serenade aux Etoiles, violist Lilias Lamont will play Tartini’s Devil’s Trill sonata, and the Haydn Gypsy Rondo trio will be played by Gill Stevenson (violin), Elaine Monery (cello) and Chris Coote (piano). Zoe Barnett will play pieces for solo guitar and to complete the programme the Full House Wind Quintet, which includes clarinettist Spence Bundy and bassoonist Alison Woodward, both teachers at Chichester University, will play works for winds.